Celebrating the life of Millard F. Hill, Jr.
Be the first to share your favorite memory, photo or story of Millard. This memorial page is dedicated for family, friends and future generations to celebrate the life of their loved one. 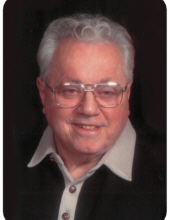 Obituary for Millard F. Hill, Jr.
Millard F. Hill, Jr., 81, of Monroe, died Tuesday, October 23, 2018, at home. He was born in Covington, Kentucky on August 18, 1937 to parents Millard F. and Helen (Iannucci) Hill Sr.
Millard had worked in the Slab Mill for Armco/AK Steel Corp for 38 years, retiring in 1993. He was a member of Christ Church United Methodist and Jefferson Lodge #90 F. & A.M.
Mr. Hill is survived by his wife, Beverly (Snyder) Hill; daughter, Sherri (Terry) Hendrixson; son, David (Kim) Hill; brother, Paul (Shirley) Hill; and grandchildren, Kayla (Josh Butler) Cox, Morgann Hendrixson, McKensie Hendrixson, Chelsea Hill & Sarah Hill. He was preceded in death by his parents; brother, Howard Hill & an infant brother; and sister, Barbara Ann Hill. Funeral Service will be held Saturday, October 27, 2018 at 12:00 noon at Wilson-Schramm-Spaulding Funeral Home, 3805 Roosevelt Blvd., Middletown with Reverend Norman Coleman III officiating. Visitation will be prior to the service from 11:00 am - 12:00 pm with Masonic Services presented by Jefferson Lodge #90 at 11:45 am. Interment will be at Woodside Cemetery. Memorial donations may be made to Ohio's Hospice of Dayton, 324 Wilmington Ave., Dayton, OH 45420-1885. To send flowers or a remembrance gift to the family of Millard F. Hill, Jr., please visit our Tribute Store. "Email Address" would like to share the life celebration of Millard F. Hill, Jr.. Click on the "link" to go to share a favorite memory or leave a condolence message for the family.